It is indeed an incredible and humbling honor to serve Robert Burns Lodge No. 464 as Worshipful Master during our 140th year of existence. Please accept my sincere thanks to all of the Brethren for your continued support and trust over the years during my journey to the East, and for the year that lies ahead. We have a fantastic team of Elected and Appointed officers! They are simply the strongest line of Officers our Lodge has seen in many years. If you enjoy seeing our ritual work done well, plan now to join us for our upcoming Extra Meetings. We have an exciting line-up of speakers and programs planned for 2010. This year we will be adding new “Fellowship Dinners” before some of our Stated Meetings, so please mark that third Thursday on your calendar and plan now to join us. We know there are a number of the Brethren who do not feel comfortable driving after dark to our Meetings. If this applies to you, please call or email one of the Officers at least a few days in advance, and we will work to find a ride for you. We are most excited in that Brother Kenneth E. Beard, Jr., PM, PDDGM will be Chairing our Masonic Education and Mentoring Committee in the year ahead. This is so very important; not only to our newly raised Master Masons, but also for those who have not have been actively engaged in Lodge for awhile. Another matter you will be hearing about in the coming months is the formation of our Historical Archive Committee. This new Committee is charged with cataloging our Lodge’s history along with our Masonic artifacts and documents. 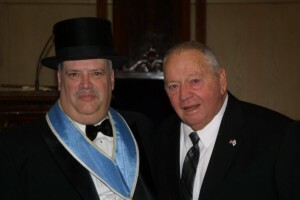 Thanks to Brother Dan Cale, you will find the most up-to-date Robert Burns Lodge information, schedule of events and speakers, news, and photos from our events on our newly updated web site www.robertburns464.org. Working together, we will achieve great things for Freemasonry in general, and for Robert Burns Lodge No. 464, in particular! You are viewing our new and hopefully improved website. Please feel free to email the webmaster with your toughts.